Mankind once lived contemporaneously with dinosaurs. Such a declaration is contrary to the predominant story of evolution, and the predominant teaching that the earth is billions of years old. Yet, according to the bible, such indeed was the case. It was during Days 5 and 6 of Creation week that God created the dinosaurs (both aquatic and terrestrial). The “great sea creatures” and the “beasts of the earth” included dinosaurs, and other extinct creatures, and the kinds of sea creatures and beasts of the earth that live today. Also created on Day 6 of Creation week was man. Thus, according to the Word of God, man once lived contemporaneously with dinosaurs. So it was for the approximately 1600 years between Creation and the worldwide flood of Noah’s time, and so it was for some time afterwards. However, eventually the terrestrial dinosaur kinds that were taken on Noah’s ark died off, and the descendants of those terrestrial dinosaur kinds have gone extinct. Likewise, it seems the aquatic dinosaur kinds (e.g., plesiosaurs) have also gone extinct. The reasons for these extinctions could be several. 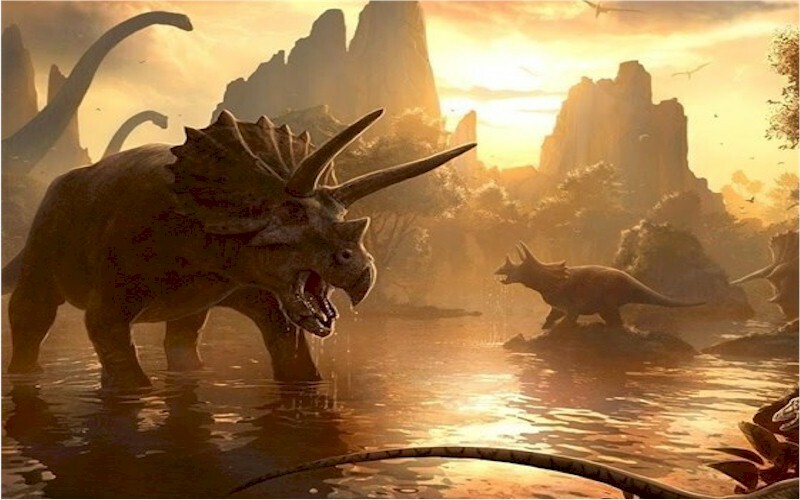 Following the flood the earth’s climate was dramatically different, and quite possibly less hospitable for dinosaurs. According to the bible, human lifespans were significantly shortened following the flood (possibly a consequence of environmental and genetic interactions); it seems reasonable that the lifespans of other living creatures also became shorter. With shortened lifespans, the larger kinds of dinosaurs may have been unable to achieve the great sizes they had before the worldwide flood (as evidenced in the fossil record; as with the huge sauropods, for example), and could have been more vulnerable to predation. As has been seen in more recent times, humans can be responsible for causing animal extinction, and humans may have aggressively hunted dinosaur kinds considered to be more threatening, such as the allosaurus or velociraptor. There are a variety of indications in cultural artistic representations that suggest there were some kinds of dinosaurs that were still alive less than 1000 years ago (see https://answersingenesis.org/dinosaurs/humans/stegosaur-engravings-at-ta-prohm/). There is even suggestion that mankind may have tamed and employed dinosaurs as draft animals. While this may seem incredible (apart from the seeming evolutionistic and old earth stumbling blocks), God gave mankind dominion over the beasts of the field, and even today we see the employ of huge powerful elephants in human service. If, as God’s word informs us, man once lived contemporaneously with dinosaurs, it is eminently feasible that man have also used some kinds of dinosaurs as beasts of burden, draft animals, and for other purposes.